Can you imagine a basketball court without black players? There were no black basketball players until the 1960s because of racial discrimination. “Glory Road” is based on a ’60s college basketball league. Western College’s basketball team, which is located in Texas, was one of the teams at this time where there were no black players. The Miners, the basketball team’s name, was ranked lowest in the NCAA (National College Athletic Association). Don Haskins, coach of the Texas Western College basketball team, had limited recruiting funds, so he chose black players for the basketball team. It was a revolution because at that time in college basketball leagues there were only white players. Some white players had never even seen black people! Haskins trained black players with his signature style based on the players’ individual skills. Not everyone was supportive of Hankins’ idea to recruit black players. Finally, the Miners competed against the Wildcats from the University of Kentucky, a team composed of all white players, at the championship game. “Glory Road” is a sports movie, but competition is not the only element in this movie. It includes ’60s social issues like racial discrimination. Viewers can enjoy the movie while thinking about the problem of racial discrimination. People who are not a huge fan of basketball can still appreciate the movie because of its vivid scenes of basketball competition. The footage of the games and practices are very active and speedy. This movie provides tension similar to a real basketball game. Above all, the invisible struggle of the black players on the Miners team leaves a deep impression. Black players fought against white people’s discrimination, but their trial would not exist without Haskins’ trust and help. “Glory Road” is an emotional journey because this movie is based on a real story. “Glory Road” will leave you with a strong impression, vivid scenes of basketball competition and reconsideration of racial discrimination. 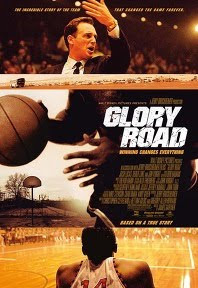 “Glory Road.” Photo courtesy of Yahoo Movies.